Both Jackson and Newton will be on hand during the event to sign prints of the Jackson painting. 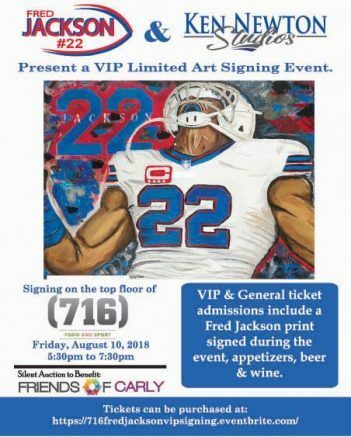 Former Buffalo Bills running back Fred Jackson and local artist Ken Newton are teaming up for an event at (716) Food and Sport in downtown Buffalo from 5:30 to 7:30 p.m. Friday, Aug. 10. The event will raise funds for Friends of Carly, a charitable organization formed in 2012 that’s focused on fundraising, donating and creating awareness for pediatric cancer and Carly’s Club. Jackson played for the Buffalo Bills from 2006 to 2014 and the Seattle Seahawks in 2015. During his recent retirement roast, he was presented with a painting by Newton, a Cheektowaga artist and owner of Ken Newton Studios. Both Jackson and Newton will be on hand during the event to sign prints of the Jackson painting. Ticket holders will also have an opportunity for photos with the athlete and the artist. Other highlights of the event will include a silent auction, appetizers, beer, wine and soda, and special appearances by formers Buffalo Bills players Aaron Williams and Bryan Scott and former Buffalo Sabres winger Patrick Kaleta. Tickets are priced from $60 to $150. For more information or tickets, please visit https://716fredjacksonvipsigning.eventbrite.com. Be the first to comment on "Football star, artist teaming up to raise funds for Friends of Carly"